Last year, my buddy and I started about 1000 IVs in our hospital. We’ve become an unofficial IV start team and get called by other floors on a regular basis to help start IVs on patients who are difficult sticks. UPDATE: Check out the mega thread with all of our IV articles on the Nursejanx Forum! At this point, in our opinion the best IVs to start are the hard ones. They help us improve our skills rather than simply maintain them, and offer exciting challenges. Plus, there’s nothing more badass than being one of the only people in the hospital who can get an IV sometimes. It’s pretty cool! Now, time for some knowledge sharing! One of the biggest mistakes I see people make is that they have a tourniquet on tight as hell, and they leave that sucker on throughout the entire process. This is the best way to make a vein blow. The goal should always be to have the least amount of pressure in the vein as possible. If you don’t even have to use a tourniquet, that’s great! Sometimes you can put one on very loose, just enough to see some veins. In all situations, you want to get rid of the tourniquet IMMEDIATELY once you see a flash of blood start to fill up your chamber. The longer you have the tourniquet on, the pressure in the vein is going to keep rising, and once you poke a hole in the vein you’ve significantly weakened its structure. TLDR; Use a tourniquet only when necessary, keep it as loose as possible, and remove it ASAP once you are in the vein. If you’ve managed to get into the vein and not blow it from tourniquet pressure, the second most likely reason you’ll blow a vein is because of valves. Check out the figure above. Our veins have valves all along them to prevent the back-flow of blood and keep it moving towards the heart. Think of them as little french doors that open every time your heart beats to allow blood to go through, and then close every time there is a pause so that gravity or other forces doesn’t pull the blood back away from the heart. If the valves are open, you can advance a catheter through them rather easily, but if they’re closed… not so much. By trying to force something through a closed valve, you are going to rupture it, and your vein is going to explode. How can I avoid valves all together? There are some things you can do to avoid valves or get through them. First, you should always test the vein to see if it has valves in the area you are trying to stick. The fastest way to find a valve is to assume that any visible or palpable “knots” along a vein will be a valve, and to look for where veins come together or branch apart. All these spots are common valve areas. But if you’re not sure, here’s a reliable method for finding sneaky valves. Start by holding distal pressure with your finger below where you’re going to place the IV, and then with the other hand, use another finger to press and push the blood proximal to the patient from where you are still holding distal pressure. Basically you’re trying to push the blood out of a piece of the vein without letting it refill with blood. Now without releasing the finger holding distal pressure, release the second (proximal) finger that you pushed the blood out with, and you should see the blood flow backwards until it stops somewhere. Wherever it stops flowing, you know there’s a valve there, because the valve stopped it from going further backwards. If the entire vein puffs back up with blood all the way back to your finger still holding distal pressure, then you should be free of valves in that entire region of the vein that you tested. You only need about 1.5 inches of valve free vein (just look at your catheter), so this is your best bet to not have to worry about valves. It’s kinda hard to explain in writing, so please check out this instructional video below for a better understanding of how to locate valves. How can I navigate through valves? Sometimes you don’t have the option to avoid valves altogether and you have to go through them. It’s rare, but it happens. I remember a guy who had a single good vein, but every inch or so there was a valve. In this case, we had no choice but to get the catheter through the valves. How do you do that? You float it! Floating in an IV is super fun once you’re good at it. Firstly, you need to get the tip of the catheter into the vein and establish a good back-flow of blood. Once you’ve gotten the tip of the catheter in, you need to advance it just a couple of millimeters further so that the entire catheter tip is in the vein, instead of just the tip of the bevel. Next, you can slowly start advancing your catheter (not needle, never needle) until you start to feel the slightest bit of resistance. At this point, you’re poking a valve, so STOP ADVANCING THE CATHETER. Back up just a bit from where you felt resistance, and connect your flush. Start pulling back to get blood return in your flush as you would if you had just placed an IV (despite the fact that half of your catheter might not be in the vein yet… that’s okay). Once you have blood return, start slowing pushing saline. 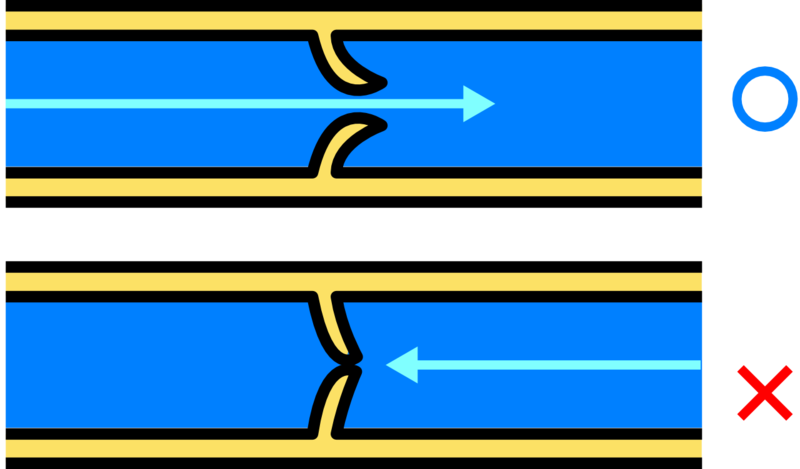 This pressure from the saline flush will open the valve, and while continuing to slowly push saline, you can simultaneously wiggle and advance the catheter through the valve. Check out this video detailing how to float an IV through a vein with lots of valves. You could do everything else right, but if you start to threat a catheter before you have the entire bevel in the vein, you can blow it. You always need an extra couple of millimeters more than when you first get a flash of blood. The first part of the bevel might be in, but if you start threading before you get the rest of it, the sharp jagged edge of the bevel can tear the vein wall, and that sucker is gonna explode. This might seem obvious to most, but you only have to insert the metal needle far enough to get the entire bevel of the catheter into the vein, that’s all. 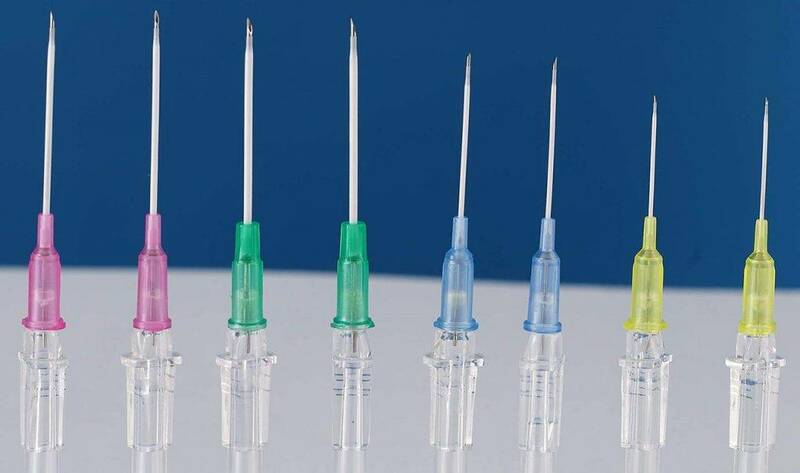 The further you insert the metal needle, the higher the chance that you’ll accidentally pierce through the vein. The plastic catheter is softer, and is the only thing you should be threading into the vein. With older patients especially, loose skin can make it hard to advance a catheter. Always hold the skin taught when advancing your catheter, or it will scrunch up and likely tear something… and it’s probably going to be the vein you just stuck. Wiggle Wiggle Wiggle 🎶. You don’t have to sing Jason Derulo and Snoop Dogg (we do), but you should twist, twirl, & roll the catheter as you’re advancing it while floating, or if the vein is a little tortuous, or if you’re just being cautious. This helps the catheter navigate through little turns, bumps, or other obstacles in the vein. Once again, this may be super obvious, but always start shallow with your approach angle and gradually go deeper. The vein might only be a few millimeters tall, and if your approach angle is too steep, you could go right through it and blow it. I’ve read articles (obviously written by noobs) that say 15 degrees minimum, all the way up to 45 freaking degrees. That’s insane! I’d say 15 degrees max for an initial approach angle, but probably even less most of the time. Just remember, you can always go deeper, but you can’t undo a punctured vein because you started out too deep. IV buddies are seriously underrated. Going into a room with a colleague takes the pressure off of just you and can help you relax. Plus, two sets of eyes makes finding a good vein easier and faster. Sometimes you need all your focus to just stick the vein, and have the other person help attach the flush, hold skin, help float the IV, reassure the patient, etc. IV starts are way easier with two people than by yourself.